Mother and Father Duck have five eggs in their nest, and they are all very special. But Ruby is the last duckling to hatch, and the last to eat and swim. 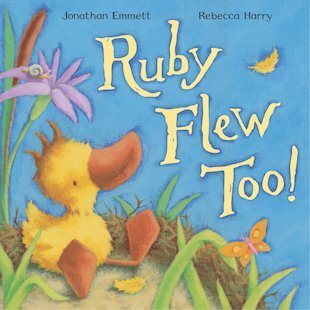 Father Duck is worried about Ruby, but Mother Duck knows that Ruby will flourish in her own time. Sure enough, when her turn comes to fly, she is the strongest and steadiest little duck in the sky! A wonderfully warm and reassuring tale that encourages children to discover the world at their own pace.